Metropolitan Hilarion of ROCOR-MP is trying to put a really good face on a really ugly situation in his formerly free part of ROCOR. Interviews given over the past two months seem to indicate that the part of the ROCOR that has joined with the Moscow Patriarchate is suffering substantially from the union. Contrasting with the recent donation of a large property to rebuild the ROCOR administration that did not go along with the union even as union discussions with different Russian Bishops who had previously separated from the ROCOR before the union have had fruitful results, the ROCOR-MP seems strangely crippled since the 2007 union took place. In response to the meaningless interdicts upon the canonicity of the ROCOR-A by the adminstration of the Patriarchate’s foreign wing, Bishop Gregory essentially nullified the interdicts by noting that the ROCOR has never historically recognized the acts of the Moscow Patriarchate. The MP’s ROCOR, lacking any response they could substantially give, issued no formal one. Meanwhile, though the lawsuits are having some effect in Latin America, the simple reality is that the life of the ROCOR under the MP is in tatters. On the ROCOR-MP’s Chicago website, there are actually 5 openings for “help wanted” for clergy, advertising “quality neighborhoods” and “growing communities”. Clearly a unstated sense of desperation is setting in, a realization that those Free True Orthodox Russians and True Orthodox converts had the driving energy that has been sucked out through the union. According to the Addendum for the “Act of canonical communion” between the “captured” part of ROCOR and the Moscow Patriarchate, there are five years to regulate and streamline the structure of the Moscow Patriarchate’s presence abroad, including the newly-reformed ROCOR. Our question is: at this rate, what will be left? We believe that the answer is best said in how this situation has played out so far in Russia itself and how it now plays out in the ROCOR jurisdictional situation in the West. A year after the fiercest persecutions over another free Russian jurisdiction, the ROAC, the Church survived, grew and moved from properties confiscated by the Moscow Patriarchate. They have continued on, understanding the mission of the Gospel is stronger than worldly powers. Today the ROAC website reports the past three days have been devoted to pilgrimages and celebrations throughout Suzdal, where the authorities could take the buildings but not stop the believers. Contrast that to the situation above, where the current “legal” owner of most of the historical buildings of the ROCOR in the US, the ROCOR-Moscow Patriarchate (in Latin America this is being sharply disputed with limited success), is overseeing an unprecedented jurisdictional decline. And as NFTU reported today, more Bishops from yet another other jurisdiction which came from the free ROCOR have made a Bishop for North America. Meanwhile, the Bishop for RTOC in the West, Bp Stefan of Trenton, presides over an increasing number of thriving communities. And we have made no mention of the contribution of former ROCOR parishes which have joined the Greek Old Calendarists, expanding their sense of mission. 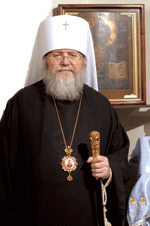 Here in the West, where there is– ostensibly– freedom of religion, free people have left and continue leaving the vacated husk of the ROCOR-MP, which is now collapsing under its own earthly weight– having abandoned the freedom that comes with the True Orthodoxy of which the great luminary of the ROCOR, Blessed Averky of Jordanville, spoke. And for that, Metropolitan Hilarion and others must put on their best face. In light of current events, they have no one to blame but themselves.